It shows the aboriginal tribe dance, the “Pas-ta’ai”, the ritual to the short people. 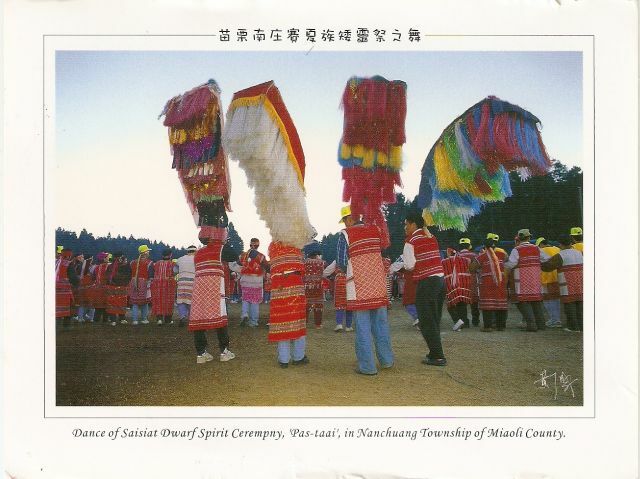 It’s a ritual of the Saisiat people, the aboriginal people of Taiwan. It commemorates a tribe of the “Little Black People” who they say used to live near to them, which some anthropologists believe may have been a tribe of Negritos who may have lived in Taiwan centuries ago, although there are no Negritos in Taiwan today. The story says that the “Little Black People” wer using magic on Saisiat people, so Saisiats decided to fight back and to destroy the relationship between the two groups. A consequence of that fight was a very poor harvest for Saisiat people, and that is why they have a ceremony to worship the Negritos‘ souls. My friend Nena sent me this postcard from her vacation on the island Pašman. I could stare at the sunset in the background for hours. This card came from an island Lopud near Dubrovnik (also in Croatia) and was sent by my dear friend Ena. :) Thank you!